This year I “let it go” with my Christmas cards…just couldn’t get it done…but I am forgiving myself and was actually able to enjoy a couple of days of cooking and baking over the weekend and for the Monday and Tuesday the kids were still in school…which was really nice! And we, too, have a countdown calendar – my daughter gets the odd days so she can do her birthday, and my son gets the evens (which gives him Christmas Eve, which he likes)…all good stuff. Merry Christmas to you!! Wonderful plan! (Letting Christmas cards go… and enjoying your Mon/Tues!) And awesome idea for the odds/evens. Be careful… next year you might need to remember who was odd and who was even and then switcheroo, 😉 Wishing you & your family Christmas joy! Oh how I love traditions, Karen! 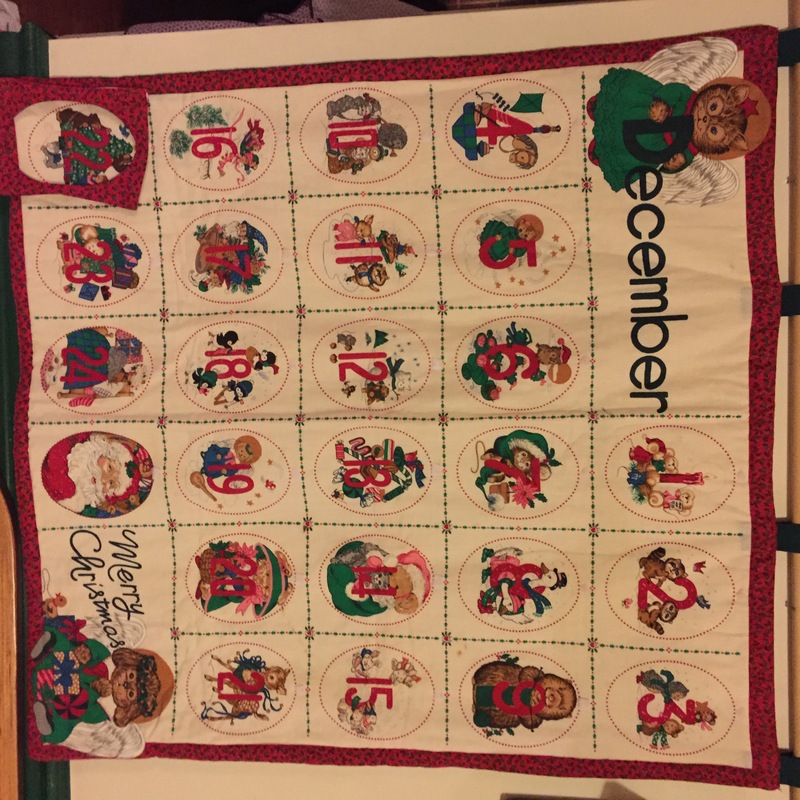 We have an Advent Calendar that we have been using for nearly 15 years! It used to be the “job” of my two older boys, but now my seven year old daughter has taken charge and updates it every day! Fond memories! Merry Christmas to you! Thanks Robyn! I hope you & your family enjoy all the blessings of the season! Enjoy making memories… Merry Christmas! I think “let it go” was a universal mantra this month — I had to let go making treats for our neighbors, and only put up a portion of the decorations we usually do …. and the planter at the corner of our property still contains the dead mums from Fall with no new holiday décor! 🙂 So be it … we have had a lovely holiday and I finished putting the breakfast egg strata in the fridge at about 1:30 am last night, sleeping in while my husband was first up to put it in the oven this morning. And our advent calendar didn’t make it out this year… but the boys have survived. It all works and reminds us of what is important. Merry Christmas, Karen! Kat, I think by sharing all of our stories, we all feel so much better, knowing we are not alone… Merry Christmas to you & your lovely family as well!